An internally displaced Syrian mother from who fled fierce fighting and heavy shelling in and around Syria’s Eastern Ghouta uses firewood and some cardboard to boil eggs for her children at Herjelleh collective shelter in rural Damascus. Reports of new alleged chemical weapons attack in Syria’s Eastern Ghouta over the weekend have been condemned by United Nations Secretary-General António Guterres, who on Tuesday repeated his call for the Security Council to “find unity” on the issue and ensure accountability. In a statement, the UN chief expressed his outrage at reports that civilians in the last opposition-held area of Rural Damascus have continued to be targeted by toxic agents. The Secretary-General’s call comes after UN Special Envoy for Syria, Staffan de Mistura, told the Security Council late Monday that at least 49 people had been killed, and hundreds were injured in an alleged chemical attack in Douma on Saturday evening. Mr. Guterres condemned the incident as “abhorrent” – echoing a statement issued in March – amid what he called “persistent allegations” of the use of chemical weapons in Syria. In both statements, the UN chief underlined his support for the Organization for the Prohibition of Chemical Weapons (OPCW) – the body which investigates allegations of such attacks. His latest statement also underlined his call for the Council to “redouble its efforts” to uphold norms against chemical weapons and agree on a mechanism that would ensure accountability. Meanwhile, in Geneva on Tuesday, UN humanitarian agencies expressed alarm at ongoing violence in several areas of Syria which has caused the mass displacement of civilians to spiral. Asked by journalists about the alleged chemical attacks, both the World Health Organization (WHO) and the UN Office for the Coordination of Humanitarian Affairs (OCHA) said they were not in a position to confirm anything. According to UN refugee agency, tens of thousands of people remain trapped in Douma and nearly a quarter of a million people need aid urgently in the wider Eastern Ghouta area. 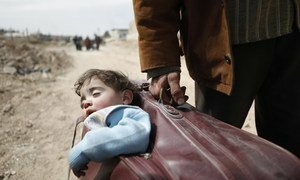 More than 133,000 people have fled Eastern Ghouta in the past month and one third of that number have been given shelter in eight centres in Rural Damascus. UNHCR’s response involves providing essential aid, shelter support and protection services, including to 137,000 Syrians displaced from the Afrin region in the north. In Syria, the mass evacuation of civilians is threatening to leave aid workers “overrun” and “acutely underfunded,” as details emerge of the unparalleled destruction in urban areas like the former ISIL-held city of Raqqa, UN senior adviser Jan Egeland said on Wednesday.